You know those hotel commercials that show the family arriving at their “dream destination” only to be shocked to discover that the hotel looks nothing like the photos? Maybe you’ve booked a hotel at a great rate only to discover on arrival that the property is undergoing a renovation and the pool and restaurant are closed? To get to your room you have to shimmy past yellow “construction” signs blocking dangerous corridors. You awaken too early to the pounding of nails and buzz of power saws? On a trip to Zihuatanejo, Mexico last month, I stayed at the Club Intrawest — a lovely oceanfront resort. Our room was glorious. The view (photo, above right) was amazing…. Unless….. you looked left. Right next to us was this abandoned construction project, garbage everywhere. Thankfully, we just had to swivel the lounge chairs a bit or head down to the pool to make the mess disappear. Can you imagine the noise, though, had it not been abandoned? I would have been sleeping one wall away from that! Club Intrawest posts clearly on its site that there is construction happening next door and that they can’t control the noise. I was expecting worse than what I got. Years ago, we traveled to a brand new resort in Myrtle Beach with friends. The resort offered lazy rivers, a huge beachfront pool, a fabulous lobby and enormous suites. The resort’s carefully cropped shots showed a wonderful facility full of happy travelers. We didn’t know that another tower at the resort was under construction or that the parking garage was behind the construction project. We had to walk through it in provided space to get to our room. The low rates pulled us in when we should have exercised caution. One day, a large cinderblock brick crashed to the ground from high atop the construction zone and smashed to bits about 5 feet behind my friend. Just a few seconds earlier and…. you get the idea. I immediately went to the front desk and they moved us to an even larger room in the main building far away from the construction zone, but still. We didn’t know that the resort was incomplete…. As internet rules toughen, full disclosure of construction problems, accessibility issues and other inconveniences (pools closed for refurbishment) will improve. Until then, it’s buyer beware! 1. Call the hotel directly to ask if the property is undergoing refurbishment (ask about pools, hot tubs, rooms, public areas — whatever matters to you). 2. Ask how old the facility is and, if relevant, when it was last refurbished. The older the facility is, the greater the likelihood of issues: leaky faucets, lumpy beds, noisy A/C units. 3. Consider whether there is construction going on nearby. Will it impact your stay? Will it affect your ability to access the property? (We drove through an area in Alabama last week undergoing a major overhaul of the interstate ramps and cross road traffic. We sat for 10 minutes without moving to allow construction vehicles to pass.) You can check state department of transportation construction websites or call the hotel to ask. 4. Read reviews from several different sources such as tripadvisor.com and oyster.com. Be sure to check the date of the review and consider the average of several recent reviews. One person might be unusually critical, but if five people share similar complaints, the concerns might be legitimate. 5. Read the fine print before booking! Don’t let the photos fool you into purchasing before reading the details on the site. 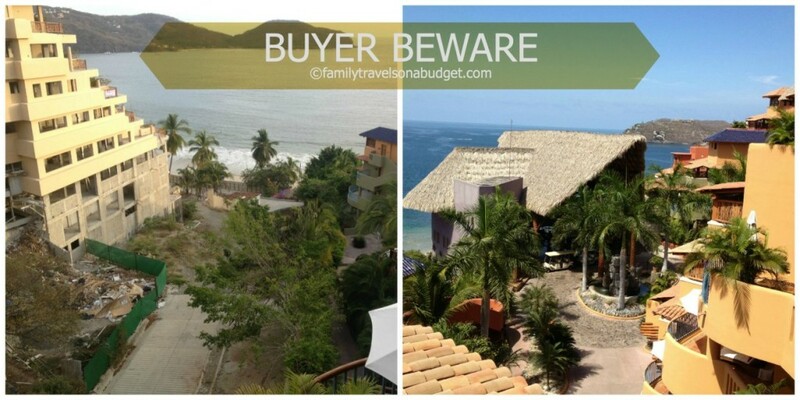 I knew before travel to expect construction noise at the resort in Zihuatanejo. The resort’s photos do not show construction project’s proximity to resort rooms. I lucked out because the project happens to be suspended. I didn’t have to deal with the noise or construction dust. I was pleasantly surprised to “only” have the ugly project to look at…. No noise! And no falling construction debris! Yay. Have you ever been lured by the fabulous photos only to be unpleasantly surprised? Share your buyer beware story…. Enlighten us! Definitely learned to do our research from now on! Oh how unfortunate. I’m glad you learned from that experience. AND I’m more glad you had an RV! I think we should schedule an awesome all inclusive vacation for four… One that has trampolines!!! Beach!!!! And maybe some dance — to get the guys out there since they love it so much! Great information, I have had that happen to me before. The room they gave me was horrible, so we went back to the front desk and asked for a refund. Thankfully, they gave us a refund. I’m glad you got a refund. The hotel industry seems to be good about making sure customers are happy. I haven’t had any troubles so far. I usually try to stay at the same hotel chain whenever I travel. I will keep these tips in mind if/when I travel again. Thankfully, I haven’t experienced something like this. Thanks for sharing these tips! Yay! I’ve only had a few disappointments. None too serious, other than the crashing brick. Luckily I haven’t yet become a victim. It’s terrible when your dream vacation turns into a nightmare! Thanks for sharing those tips. Forewarned is forearmed! We’ve had a couple disappointments with closed pools and that one close call with the brick, but as frequently as I travel, I really have been fortunate. It’s a big issue if kids want to use a pool closed for renovations or exercise travelers want a gym facility that’s closed.